All orders are shipped VIA USPS. The shipping cost for most items is based on the item's size, weight, shipping method and delivery address. You will see the estimated shipping cost during checkout. The order will be shipped to the address shown on the order. Customer has to notify us if changed to any new address before we shipped the order. Please allow 2-3 business days for processing the order to be ship out. Delivery Method (within US) USPS Priority *3-5 Business days Media Mail (Books & DVDS Only) *3-5 Business days Order over $100.00 will be shipped FREE! Note: The special offer only apply to shipment to US continental and additional shipping fee will be apply on oversize packaging. All others shipping method will be subject to charged the actual postage on the order. 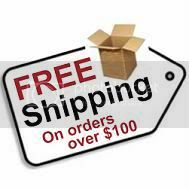 No free shipping offer on special/discount items. King's Hobby Shop's goal is to provide the same excellent customer service we offer our patrons in store as well as online. You have 30 days to return a product. King's Hobby does not issue cash refunds. We will be glad to replace the product if it is defective or exchange the product out with another product. You must pay for shipping if you wish to exchange, but King's Hobby will pay the shipping fee if item is defective. * The item is in reselling condition and in its original packing or * The item is defective and is in its original packing. King's Hobby will check the product and make sure that it is an applicable return. For more information Telephone: (512) 836-7388 Fax: (512) 835-6485 Please feel free to email us !